Lyin’ Ted Resorting to Desperation Tactics? 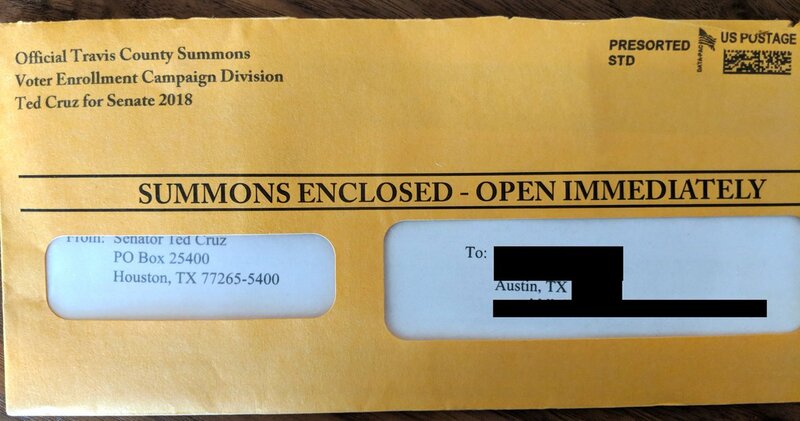 Sen. Rafael Edward “Lyin’ Ted” Cruz (TP-Texas) has been sending out letters soliciting campaign funds which are disguised as an “Official [Insert County Here] Summons” and as shown above state in big bold letters “SUMMONS ENCLOSED – OPEN IMMEDIATELY”. This is an attempt to use a deceptive but apparently legal tactic to increase the rate at which recipients open the letter instead of immediately tossing into the trash can (or recycling – something that would no doubt piss off the Senator). As deceptive as the envelope is – the tactic is legal as long as the contents are clear that it is coming from a campaign. But you have to wonder at this desperate of a tactic. Well you might have to wonder if this wasn’t coming from Lyin’ Ted. As much as Trumph The Insult Comic President™ has gotten wrong – he seems to have been spot on with his characterization of Cruz’s true nature. Red is only surprised that Cruz is not telling Red that he “May Already be a Winner!” or that he is the favored nephew and only heir of the late former minister of oil development of Cote d’Ivoire and needs some help transferring $26,000,000 to a U.S. account. This entry was posted in Texas Politics, Uncategorized and tagged Lying Ted, Lying Ted Cruz, Ted Cruz, Texas Politics, U.S. Senate on September 17, 2018 by Red from Texas.